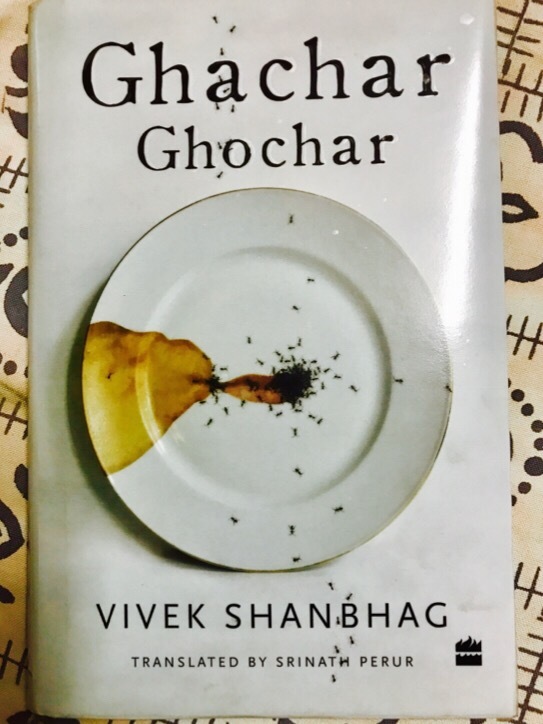 Ghachar Ghochar by Vivek Shanbhag was translated from the Indian language Kannada. This book is pretty famous so I was curious to see what the hype was all about. Most reviews said that this book made them nostalgic about old Bangalore. There were few times it did make me nostalgic but overall it was pretty meh. The one star is just because I was able to relate to some descriptions in the book like putting rangoli in the morning and such simple incidents. I still couldn’t relate to a lot of things since I was never poor and never lived in a small house or poor locality. But overall, I didn’t get the point the author was trying to make. I definitely don’t think money was the culprit here. The main protagonist has problems with every single woman in his life and keeps talking about how women are evil. These statements throughout the book made my blood boil. I have seen enough chauvinist men in real life that I didn’t want to read about them in literature too. Writing was great though – translation done by Srinath Perur. I think I would prefer reading about women warriors or engineers in fantasy or sci-fi literature, instead of books like these. Thanks to this book, I remembered why I avoided Indian contemporary literature. It looks like this book would have been more appropriate if it was published during my grandmother’s time or a century back. Nothing is relevant in the present day. Also nothing really happens and there is no plot and it is just a character study. 1. He broke up with a woman since she was a feminist and worked for women’s welfare organization. Whaaaat?! 2. “Are you going to just sit there bawling? Heat up the food and serve him.” – this is how his father speaks to his mother and the main protagonist justifies this saying – “He set her to work and calmed her somewhat”. What a way to calm an upset woman! 3. About his sister leaving her husband – “Maybe she had got used to having whatever she wanted and this diminished her capacity for the inevitable compromises that accompany marriage”. Someone please remind me why one has to compromise in marriage? Compromises don’t make a marriage successful. It is mutual love and respect which makes it work. Looks like the author is saying that women will compromise if their father is poor, so it is better that way. 4. “Whenever I try to start, I quickly run into one of three women – Amma, Malati or Anita – each more fearsome than the other. I sometimes wonder if their every moment is spent sharpening their tongues, silently accumulating resentments for later use” – what a way of describing the only three women in protagonist’s life. He keeps emphasizing how hard working the men in the family are but doesn’t appreciate women. It is as if women have no better work to do other than picking fights. 6. “I’ve always wondered if she’d have turned out as spoiled without his pampering” – spoiled because she left her husband for whatever personal reasons. 7. “Very argumentative at work. And apparently with her in-laws as well. No wonder he was driven to get rid of her” – this is how characters discuss the murder of a woman by her husband who killed her since she was not taking care of his parents. Overall, it wasn’t boring or as bad as some of the other books that I DNFed. I was able to finish the book but it left a bad taste in my mouth. These days, I look at how well the women are represented in a novel. I don’t mind novels where there are no women characters but misrepresentation bothers me a lot. Thanks for the review and warning. Looks like you are angry. Absolutely appreciate the review. I was going to buy this book, and now I have decided not to. And I heartily agree with your view: I’d rather have less women characters than have a misrepresentation! On another note, please suggest a newer Indian author/book that you enjoyed. There were only two Indian books that I liked in the last few years I think (since I have not read many). I liked Twinkle Khanna’s Mrs.Funnybones and Bucketlist of a traveloholic by Sarika Pandit (great book if you love to travel). I have picked few more Indian authors recently. Hoping that those will be better. I have no words for some of the things you quoted here. Is this a fairly recent release? Not that it would be okay at any point of time, but in this day and age this is like a 100 steps back. So annoying! Thanks for the review, I will save myself the aggravation and skip this one. I think the English version was published in 2015. I am not sure about the Kannada one though. But most likely a very recent novel. I don’t know what it is with Indian male authors and their chauvnist writing. I read your review about Half girlfriend recently and was so furious! Ugh the quotes I picked from Half Girlfriend were the less annoying ones (hard to believe, right?). I just couldn’t bring myself to list out the truly aggravating ones. And this guy is our country’s top selling novelist! I mourn for the direction literature is headed. Yeah seriously I feel bad for folks who think books like Half Girlfriend are great pieces of literature 😦 Somebody should guide them to better books. It was on my TBR list too. I feel chauvinist characters (whether male or female) are particular to the context/world built by their creator. Why generalize? Being a woman, I cannot read a book where every single woman is shown to be evil and money hungry since in real life, not every woman is bad. There is a mix of good and bad men and women and literature should portray that I feel. Never heard of this book but… yikes. Men complaining about women is such an old and tired trope, and I see it every day. That book would’ve left a bad taste in my mouth, too. Yeah I am fed up of reading such books. Books written in 50s and 60s were full of such tropes I think. They really were. Even some books written today have that lingering misogyny with the addition of the kind we currently face.